RLGT Style: Rap Game Hard, Bag Game Crazy – redleafgoldteeth. redleafgoldteeth style praises Canadian fashion. In this segment we show you what we are currently rocking, while giving a couple tips along the way. Be inspired by the world around you, but put your own twist on it. Be a tastemaker, not a tastetester! Catch RLGT Style every Tuesday! Welp, that time of the year has come again. That time of the year when its somehow the last week of August, and you have class next week, and you have no idea where the last 4 months went. Sound familiar? If this is the case for y’all like it is for me, this also means one positive thing: Back To School Shopping. This used to mean heading to Staples and picking up binders, but the older you get turns less about the supplies and more about finding the swaggiest possible gear for the first week of class (when you’re still showing up regularly). For me, this has meant a ton of online shopping with this summers tip money, instead of the usual hitting the States, since the dollar is so crappy. Usually back to school shopping is reserved for the shoes, and the shirts, and the hats, etc, but a seldom thought about item is the bag that you will be using EVERY DAY, as opposed to certain fits which may see the light of day 2-3 times a month. 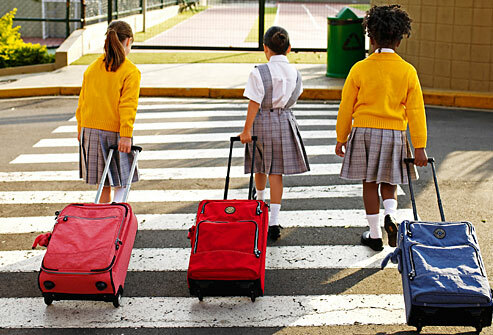 Having proper bag game is very important, especially in University, because nobody wants to be the kid with the wheely-backpack, no matter how good it is for your posture. How you look showing up to University with a wheely-backpack. Since starting school at the U of C I’ve always had one thing in common (with a ton of other people). My Herschel bag. The Vancouver based company has been growing more than steadily over the last 6 years, and its nearly impossible to go on to any campus anywhere without seeing the bags. They’ve now expanded from backpacks to wallets, laptop bags, other travel accessories, and even apparel. Their modern take on classic styles is quite refreshing, refined, and timeless. As you can see, the Herschel line is quite expansive as far as different options go. In addition, each style comes in a variety of colors, so unless you have mild taste, you won’t feel like everyone has the same bag as you. Overall I’ve been lucky with all of these finds, the backpack from Portland, the Travel bag as a gift for my trip to the Dominican, and the Laptop bag for free from one of my moms conferences. 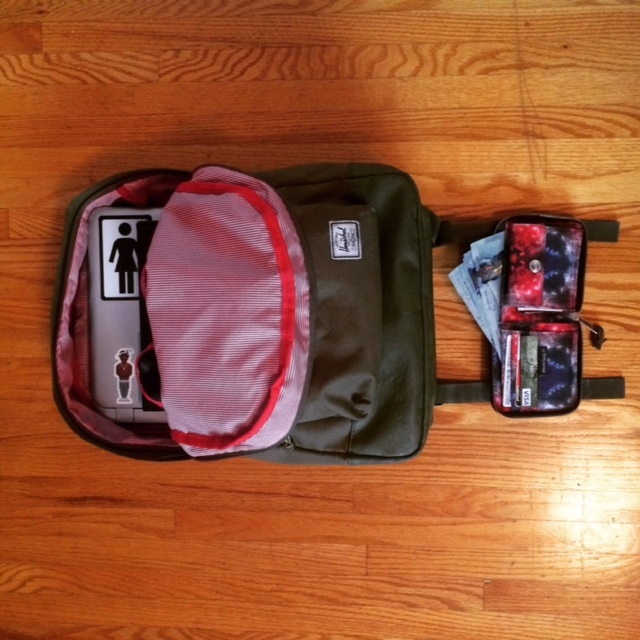 The other 2 items I picked up on the Herschel online store as needed, although you can find the backpacks and wallets just about anywhere now. The online store is super cheap shipping within Canada (never been more than 10$ for me, and sometimes even free), and the items come super quick in Western Canada for obvious reasons. I’ve received both of my packages within 2 business days, sometimes even before I got a confirmation email back from them! My 2 most used, and favorite items are the backpack and wallet. As stated having a good, comfy bag for school that holds a ton, and is still easy on the eyes is important for any student. Furthermore, the “Pop Quiz” bag is the one I started University with, and features a full padded Laptop sleeve which comes in super handy. I like the mono look of this particular one, and the Olive color is one that I’ve never seen here in Canada. In regards to my love for the wallet, this one just comes down to pure pickiness (is that a real word? Meh). Every year since I can remember, my Aunt would buy me a new wallet every Christmas, with last years hitting the fritz around October. I previously elected for Nixon wallets every time, because I FIEND a change pocket in my wallets, which is becoming more and more rare. The awesome thing about the “Walt” wallet is that the zipper is on the outside of the wallet, because the zipper is usually what goes first because its usually a small finicky one located on the actual change pocket. I know I’m real suspect about it, but having change all in my pockets is a definite pet peeve. Finally, the Galaxy print is the final touch that makes this wallet cool to me, with a business-in-the-front, party-on-the-inside kind of feel to it. As always, y’all know the drill: WEAR WHAT YOU LIKE. 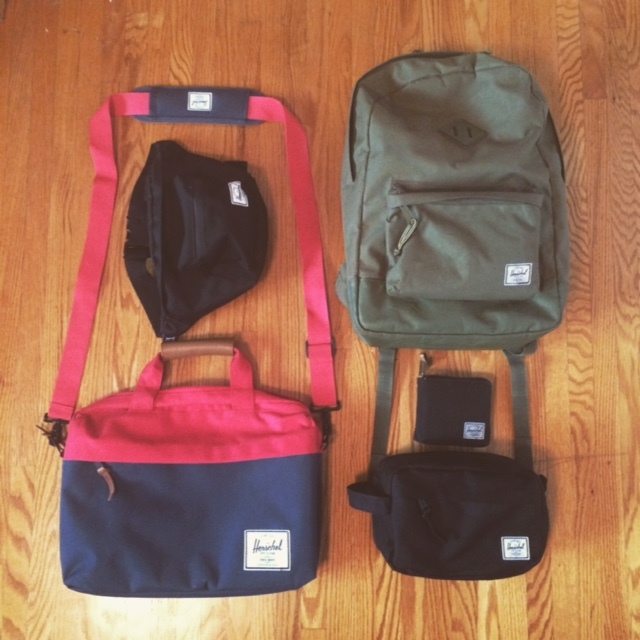 To me, the best thing about Herschel is the amount of options available for personalization. The amounts of styles and colors mean that you’ll never feel boxed in. Of course there are tons of other bag companies for whatever your needs may be, but this is just the one that works well for me at the time being. Find what you love.